Virat and ABD's knock yesterday helped RCB to their maiden victory in this IPL. The Royal Challengers Bangalore (RCB) have been one of the under-performers of the IPL. There’s no denying to the fact that the teams haven’t performed up to its standard in the history of the Indian Premier League (IPL). Despite having the likes of AB De Villiers and Virat Kohli in its ranks, the franchise has still not been able to lift the coveted IPL silverware. The 12th edition of the T20 tournament has been no different for the Bangalore-based franchise. Before Saturday, the team had played a total of 6 matches in IPL 2019 and had faced defeat in all six of them. Howbeit, the Virat Kohli-led franchise finally registered a victory, yesterday, after defeating the Kings XI Punjab (KXIP) at the IS Bindra stadium. Whilst taking part in the second double-header of the day, RCB took on Punjab and with the help of Virat Kohli and AB De Villiers’s batting heroics and handy contributions from Yuzvendra Chahal and Navdeep Saini, the team finally got better of the opponents and eventually got its first win of the season. After winning the match, the AB-Kohli duo was again seen spending some fun time. The two undoubtedly share tremendous respect for each other and the bromance between the two isn’t hidden from anyone. Off the field, whenever they get time, the two make sure that they don’t fail to entertain the fans and cricket aficionados. Yesterday was no different as after helping RCB in registering its first victory, the duo was finally seen having a go at each other. Post the match, AB was seen asking questions whilst Virat, was cheekily answering them. At one point of time amidst this talk, when the question was about how enjoying is it to play alongside De Villiers, Virat gave a very cheeky answered and made a very cute revelation. “Being ur neighbor this time in the hotel back home, it’s been the most lovely experience and the thing we look most forward to was your kids waking up in the morning & knocking our (Virat & Anushka’s) door & saying good morning to us every morning which is quite special,” – The 30-year old was quoted saying as after the match. Meanwhile, the next challenge for the two comes in the form of Mumbai Indians (MI). 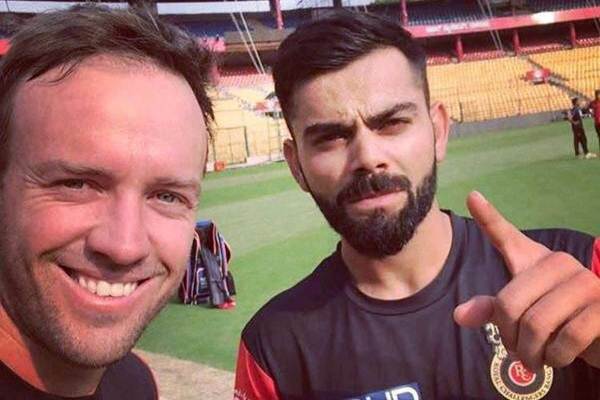 Virat Kohli and AB De Villiers will undoubtedly like to carry this momentum ahead and keep the hopes of their team alive.